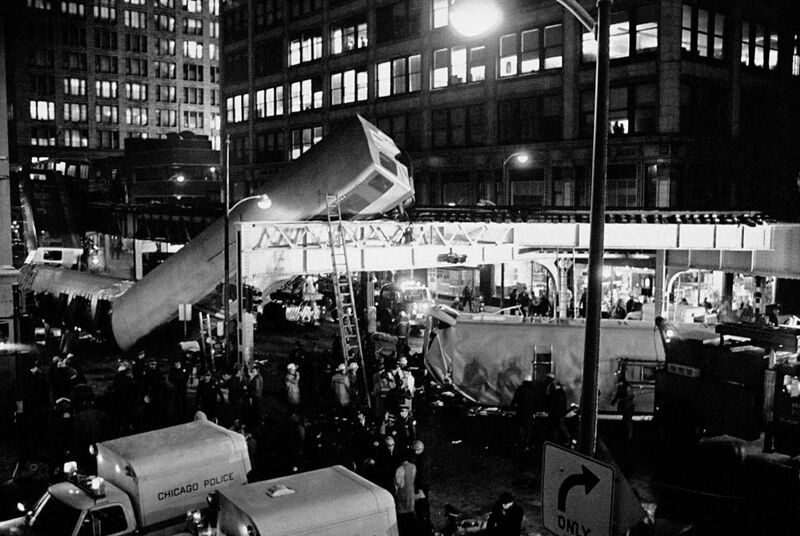 February 4, 1977 – At least a dozen people are killed and close to 200 are injured when an elevated train falls from the Loop elevated tracks to the street below at Lake Street and Wabash Avenue. The crash occurs in the heart of rush hour, about 5:25 p.m., when an eight-car Lake-Dan Ryan train begins to round the curve at Lake and Wabash and slams into the rear of a Ravenswood train that had stopped to allow a preceding train to clear the station ahead. The second and third cars of the Lake-Dan Ryan train land on their sides in the street, while the first car is propped against the elevated structure with one end resting on the pavement beneath. Police and fire units work for two hours to free people who are trapped in the wreckage. Fire Commissioner Robert Quinn calls the crash “one of the worst wrecks I have seen.” [Chicago Tribune, February 5, 1977] Mayor Michael Bilandic says, “All city departments – police, fire, streets and sanitation, public health – everybody Is here.” Subsequent investigation reveals that the motorman of the Lake-Dan Ryan train, who had a poor safety record, had been smoking marijuana. The best guess was that somehow he had overridden the restrictive cab signal and had left the preceding station at a rate of speed under 15 miles per hour, slower than the speed which would have triggered an automatic control signal that normally would have stopped the train before impact. February 4, 1862 -- A man named Frederick Kuntz is arrested for shooting his wife. The Chicago Daily Tribune's coverage of the unfortunate event makes me wish that newspapers could return to this style. 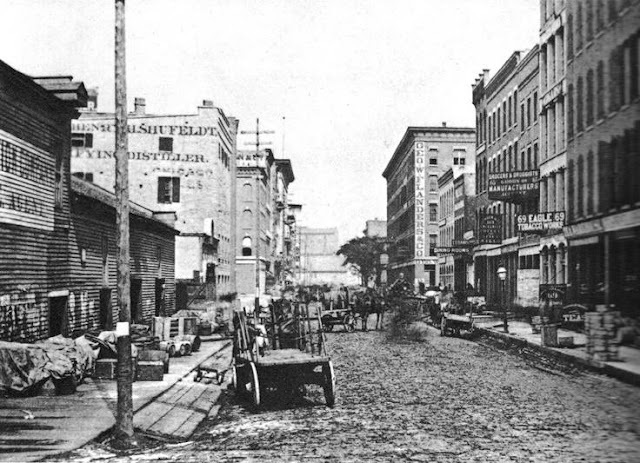 The article reads, "Kuntz was formerly a bar-tender in the employ of one William Veitz, who kept a saloon on Wells street, between Washington and Madison streets. In the course of time Veitz died, and the bar-tender married the widow, after she had sported her weeds a sufficient length of time, and succeeded to the charge of the saloon. 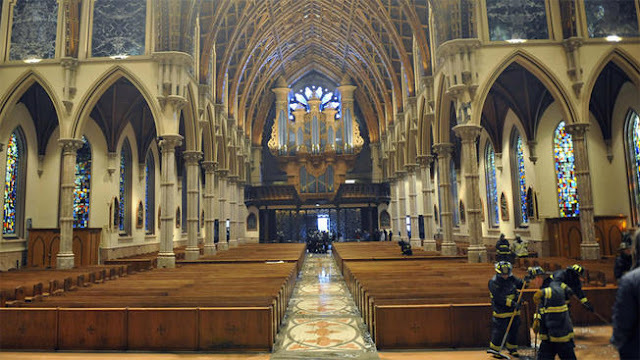 The honeymoon was brief, for business is business and time is fleeting. Scarcely had it waned ere trouble commenced. The bar-tender manifested an affinity for other widows, and the widow for other bar-tenders. Criminations and recriminations followed, and the spirit of jealousy was aroused upon each side. On Sunday it culminated in a violent quarrel, during which Kuntz drew a revolver and discharged three barrels at her, the contents of the third taking effect in her side and inflicting a dangerous, and if inflammation sets in, a mortal wound." The bar-tender manifested an affinity for other widows, and the widow for other bar-tenders . . . you HAVE to love that kind of reporting!